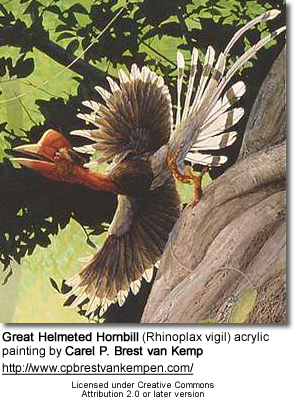 The Helmeted Hornbill, Rhinoplax vigil, is a very large bird in the hornbill family. It is found in the Malay Peninsula, Sumatra and Borneo. Unlike many fruit-eating hornbills, it is sedentary and pairs maintain a territory. Males fight over territory on the wing, ramming each other with their casques. It has mostly blackish plumage except that the belly and legs are white and the tail is white with each feather having a black band near the tip. The tail is long and the two central tail feathers are much longer than the others, up to 1 m, giving the bird a length up to 160 cm, the longest among hornbills. The body length is 95–120 cm (38–47 in). Males weigh 3.1 kg (6.8 lbs) and females weigh about 2.7 kg (5.9 lbs). This species has a bare, wrinkled throat patch, blue in females and red in males. The casque (a large display growth on the upper mandible of the bill) goes from the base of the bill halfway to the tip, where it ends abruptly. It and the bill are yellow; the red secretion of the preen gland covers the sides and top of the casque and the base of the bill, but often leaves the front end of the casque and the distal half of the bill yellow. Unlike other hornbills, the Helmeted Hornbill's casque is solid, and the skull including the casque and bill may constitute 10 percent of the bird's weight. The call is described as hoots followed by maniacal laughter. This bird eats mostly fruit, especially Figs. It may also use the casque as a weighted tool to dig into rotten wood and loose bark in search of insects and similar prey. The casque is the source of a valuable carving material, hornbill ivory. Indigenous peoples also use the central tail feathers to decorate dancing cloaks and head-dresses. The Punan people believe that a large Helmeted Hornbill guards the river between life and death. 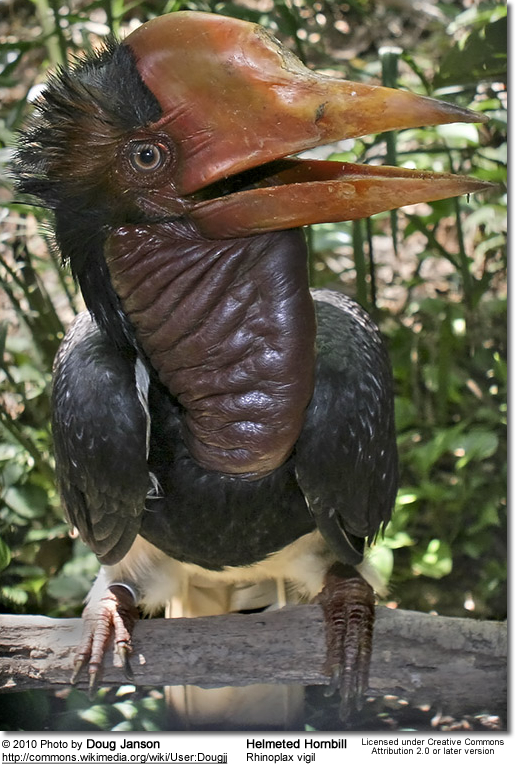 As it is hunted in some areas and losing habitat, the Helmeted Hornbill is evaluated as Near Threatened on the IUCN Red List of Threatened Species. It is listed on Appendix I of CITES. Perrins, Christopher (ed.) (2003). Firefly Encyclopedia of Birds. Firefly Books. ISBN 1-55297-777-3. Kemp, Allen (1994). Hornbills: Bucerotidae. Oxford University Press. ISBN 0-19-857729-X.